As I’ve written before, I hate fiction. 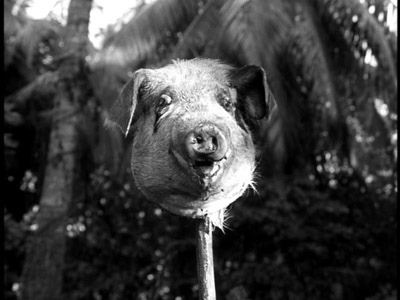 Lord of the Flies is a book by William Golding. I read it in high school, and found it both intriguing and terrifying. But now I’ve read Pinker, and I’ve read Deutsch, and that has changed everything. I just finished Lord of the Flies again. It isn’t hard to sum up the message of the book. “What evil lies in the heart of men (er, um, boys)?” The first time I read the book the message resonated with me. I was deeply interested in the question of evil. Are we basically good, but trapped in a society that drives us to evil acts? Or are we basically evil, with the veneer of society (barely) keeping us from one another’s throats? It was clear to me then. I was of the former persuasion; this book was of the latter. It was a challenge to me, and I remember convincing myself (rather unconvincingly) that the boys who turned to savagery had been trained by the society in which they were raised. After all, I said to myself, they are only on this island because they themselves were escaping war. War was pounded into their good little hearts from the beginning. How could they have become anything other than what they were? Society made them evil. Golding, I believe, had just the opposite opinion, and would respond by saying that we had created that society, we had created that war. Even after all the years of bloodshed, we still hadn’t learned our lesson. Here we were, bombing and killing even now as we try to teach our children better. What a pair of simple souls. Now I know better. The choice is a false one. All evil results from a lack of knowledge. And there was plenty of missing knowledge on that island. This is not a condemnation of the boys. They were faced with the task of creating a new society. That the society they finally formed was an immoral, irrational, awful mess is no surprise. Almost every society in the history of humankind has been an immoral, irrational, awful mess. These boys, however, came from the West. They tried to emulate what they’d learned of the grownup world. Ralph found the conch, the symbol of civilization, lawful rule, and reasoned discussion. The boys tried to create knowledge. They used Piggy’s glasses to create fire. They made smoke to send a signal to the outside world. They tried to encourage creative thought and rational criticism. And they almost succeeded. In the end, they failed. The beast became their god. The conch was destroyed, along with Piggy, the voice of reason on the island. Anti-rational memes are powerful things, and humans are imperfect, prone to error, bound to make mistakes. The biggest mistake of all, the one that proved literally fatal, was the suppression of criticism, the use of violence rather than discussion, the slavish devotion to ritual and superstition instead of creative thought and critical analysis. But why the beast? Why the failure? What is it about humans that makes us so bad at government? This is what Golding was trying to get at, and where in the end I think he failed, falling back on the evil in men’s hearts business. I don’t know any better than Golding did, but I do know this. It’s easy to be wrong, and hard to be right. All our knowledge is fallible. The West, the Enlightenment, civilization, are far from perfect. But they’re our only hope. My hope comes from a human trait that Golding little explored, but that I believe is deep and ingrained. When you have a sore in your mouth, you have to touch it with your tongue, even though you know it will hurt. When you hear a bump in the night, you have to go see what it is, even though you may be frightened. When God told Eve not to eat of the Tree of Knowledge, what did she do? Crunch! The beast was only a dead parachutist. Golding made one enormous error in having only Simon ever try to find this out. We all wanted to know. That’s why Golding told us. The boys would have wanted to know, too. They would have gone. They would have investigated, despite their fear. They would have poked the beast with a stick, ran, slunk back, poked again. Finally, they would have learned the truth. That same trait, of course, led to the “atom bomb” war that Golding was so convinced was our destiny. The keys to heaven and hell are identical. But we cannot ignore them. If the beast is in us, as Simon tells learns via the terrifying pig’s head, then our only chance is to go face the beast, journey to the mountain, stare the creature down with the only tools we have, our rational selves. Some work I’ve been doing recently plus an exciting report from the Kepler mission has got me thinking about the Drake equation and extraterrestrial civilizations. So what did you get? Are you optimistic about the number of civilizations in our galaxy? As I think about the question, “Do you believe in extraterrestrial civilizations?” it occurs to me that there are in fact three possible responses. The first is no. The second is yes. The third is, “what a ridiculous question.” Let me explain. We can easily imagine living in a world where the question, “Do you believe in extraterrestrial civilizations?” would equally be silly. If extraterrestrials had obviously altered their environment, if they were visiting our planet regularly, or if, in fact, we had been colonized by these beings, there would be no denying the existence of intelligence other than us. Here are my numbers; let me know where we differ and why. This should be the most certain number in the entire equation, but it turns out to be more difficult than you might suppose. The key is “Sunlike”. How wide or narrow a net does that cast? Could stars in double star systems still be Sunlike? What about stars that lack metals, because they didn’t form near enough to supernova remnants? What about stars too near a black hole or other radiating body? I’m going to use a number of 100 billion here, although I suspect this number may be a bit too high. This is where the new Kepler data comes into play. Kepler gives us a number of around 20% for Earth-sized planets in an Earthlike orbit – pretty large, considering all the ways things might go wrong in a Solar System. Here I’m assuming that to be Earthlike a planet merely has to be the right size and at the right distance. There might be all sorts of other factors I’m leaving out, like needing a big Moon and so on. But I’ll combine Fp and Ne into 20% (times 1), even though I think it might be too high. I’d always been highly optimistic on this number, until I read an argument by Paul Davies in The Eerie Silence. My original feeling was that because life seems to have appeared on Earth as soon as it possibly could have, life’s origins must not be all that difficult, given a few million years and a planet’s-worth of the right ingredients. Davies’ argument made me question that assumption. Here it is: we’re here. It took almost 4 billion years for us to get here. At best the planet has another billion years left where our evolution would have been possible. Perhaps it is only on that (maybe small) subset of worlds where life started quickly that intelligent life had the time to develop. So of course we find ourselves on a world where life started almost right away. Maybe. It’s an interesting argument. But if life was an incredibly lucky accident, why couldn’t complexity have happened a lot faster via its own set of lucky accidents? We’ve only just started this origin of life business, and there are already so many possible channels, it seems to me likely that life can get started quickly, and unlikely that there’s some fundamental barrier to every path. This is one factor that could potentially get a lot more certain very soon. If we were to discover just one independent origin of life, either on Mars, in the biosphere signature of an extrasolar planet, or even here on Earth, then the likelihood of life beginning elsewhere would shoot up. I think this will happen – the stuff of life is just too common in the universe for life’s origin to be some rare one-time occurrence on this planet. I remain guardedly optimistic on the question of life and enter a figure of 90% for the number of Earth-like worlds on which at least simple life gains a toehold. Once upon a time we looked at the natural world and saw just animals and plants. Animal, vegetable, mineral, remember? Then we made a concession to the oddballs and called them protists. Now we look out there and see a plethora of groups, with only a tiny few (the plants, the animals, and the fungi) showing a move toward complexity. We, it turns out, are the oddballs. And of these oddballs only animals have developed even a little intelligence. How much would change if that one, thin twig holding animals had been snipped early on? To put it another way, how much would you miss any of the other branches? The late Lynn Marguils and her colleagues developed an alternate tree that emphasized symbiosis over branching – i.e. we’re not just animals. We’ve incorporated other beings into our ever cell. Mitochondria for animals, chloroplasts for green plants, even our own DNA-holding nuclei. 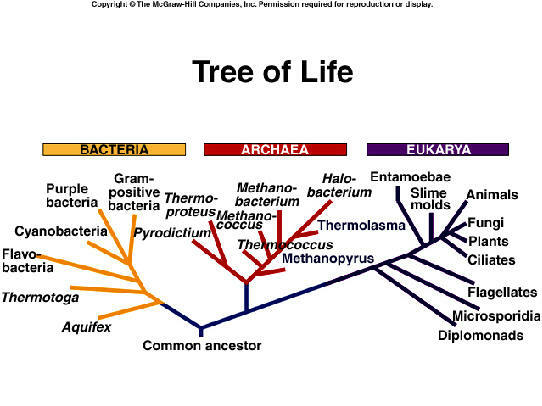 All these were once free-living organisms, members of one of those other branches. That, I think, makes my point even stronger. How many events had to happen just so to make complex life even possible? What if even one had turned out differently? Complexity, history seems to be telling us, might be quite rare, and intelligence rarer still. The calculator I’m using here only goes down to one in a million for Fi. I think that might still be too optimistic, but I’ll go with it for now. We are so very, very new at this technology thing. There are people alive today that still remember the very first radio broadcasts. Even though we’re a young species, the amount of time we’ve had a technological civilization is a tiny fraction even of that number. It took us a long time to get here. Might we have not made it at all? As a test case, I point to the Neanterthal. Here’s a species that arose, just as we did, from African ancestors. Neanderthals expanded into Europe and Asia, became adapted to cold weather, evolved huge brains (in many cases bigger than ours), learned to use fire, probably had spoken language, hunted the largest and most dangerous creatures in their ecosystem, and of course made and used tools. But here’s the rub. Neanderthals developed a stone tool kit and then did not change that kit for 100,000 years! It’s astounding to even think about that level of stasis. Life 200 years ago is practically unrecognizable today. Even pre-civilization, our ancestors were inventing bone fishhooks, musical instruments, art, jewelry, sewing needles, and on and on. But the Neanderthals stood stock still for a hundred thousand years. Suppose we had never come on the scene? Could all of life’s pageant, nearly four billion years of evolution, have resulted in the Neanderthals and then have gone no further? Why not? The Neanderthals stood technologically still for 100,000 years. Would they ever have developed radio telescopes, if the world had been left to them? Why would they, when in 100,000 years they didn’t even learn how to fish? What if, at any time before today, a giant asteroid had come our way? Not only could the Earth have not prevented an impact, but not one species on Earth would even have known it was coming, or even that such a thing might be remotely possible. No Neanderthal was ever going to deflect an asteroid. Neanderthals are just one example of the move away from complexity. When one studies the evolutionary record, one sees again and again a move away from innovation and creativity and back toward the tried and true. Ancient apes evolved into innovative chimpanzees and of course our clever ancestors, but also into non-innovative gorillas and orangutans. Australopithecines gave rise to the first homo, but also to their own robust forms with giant jaws and sedentary lifestyles. And homo itself gave us the hobbits, H florensis, as well as the Neanderthals. An honest assessment says there are plenty of ways to not develop radio astronomy. And then there’s the fact that even we H. sapiens could easily have never experienced the Enlightenment, could easily have disappeared without ever understanding what a star is, let alone what a radio wave is. Both pre-history and history suggest to me that arriving at one achievement (like a big brain) is absolutely no guarantee of moving up to the next one. Maybe I’m too pessimistic here, but again I’m going to pick the one in a million option. Finally we come to the lifetime question, where hand-wringing and moralizing abound. We’re going to blow ourselves up. We’re going to create nanobots that will turn everything to grey goo. We’re going to unleash a genetically modified disease that will wipe us out. We’re going to use up all our resources and slowly choke on our own exhaust, buried in our own garbage. Well, maybe. It’s all so moralistic. We’re too successful. We’re too powerful. Our knowledge is greater than our wisdom. Admittedly, humans are different from any species that has ever lived on this planet, so comparisons may no longer work. But keep in mind that too much of anything isn’t what brought on extinction for virtually every species that has ever evolved on this world. Rather, these species went extinct precisely because they were living within their means, and then something came along that did it better. Similarly, human societies have not fallen due to overuse of resources. Rather, they have fallen due to lack of knowledge. I take a different view. I learned from David Deutsch that the only infinite future is one that is unsustainable, one that depends upon the next innovation. I learned from Steven Pinker that we’re not getting worse, we’re getting better. We’re smarter, more moral, and less violent than at any time in our past. I believe this is (once an event like the Enlightenment happens) the most likely path for any intelligent species. Even if it’s not, I think we at least see how such a future is possible. And if it’s possible, then surely one (and it only takes one) civilization will make it. Not just to a long-lived civilization, but to a galaxy-transforming civilization. Now we return to my original point. Where are they? If I’m right, if civilizations aren’t limited even by the life of their own star, why don’t we see evidence of the extraterrestrials in our neighborhood? Let’s run the numbers. I’m going to put 100% in for L, even though of course this wouldn’t apply to the home star of the civilization – since it certainly takes some time to evolve. It refers, instead, to the overall lifetime of the universe, and reaches into the tens of billions of years. Wow. I’m saying that in this galaxy we are very likely alone. That’s why we don’t see them. They’re not there. But wait. The universe is very large. Multiply that 0.036 by the number of suitable galaxies we can see, maybe another hundred billion. What do we get? My argument is that of all the galaxies we can see in the sky, roughly one out of a hundred is home to a technological civilization that is even now in the process of colonizing their galaxy. We’ll probably never talk to these beings, but we still might know they’re there. How? By their works. If these beings are truly independent of their own star, then they must of necessity be “terraforming” their own galaxy to make it more suitable for themselves. Perhaps they’re building Dyson spheres around clusters of stars, so as to collect every bit of energy it gives out. Perhaps they are altering the rates of supernovas or gamma ray bursts, so as to protect themselves from catastrophe. Perhaps they are harnessing the power of black holes in a detectable way. Perhaps they are altering galaxies in ways we can’t even imagine. When the signal comes, and I believe it will, it won’t come from our own galaxy. It won’t be a radio transmission welcoming us into the federation of planets. Instead, the signal will come from a galaxy far, far away, a galaxy that at first looks a little peculiar. As we examine its feeble light more closely, as we one by one eliminate natural explanations, we’ll slowly realize that something extraordinary is happening (or rather, did happen, as we’ll be looking into a long-ago past, delivered on light beams millions or even hundreds of millions of years old). And what would such a discovery mean? Just this. Someone made it. Someone figured out how not to push the red button, how not to release the grey goo nanobots, how not to destroy what we’ve created but rather work together to make a society that might last not just a long time but forever. We may never know much about these beings’ science, and even less about their art, their religion, their philosophy. But we will know that they found a way. And so might we. 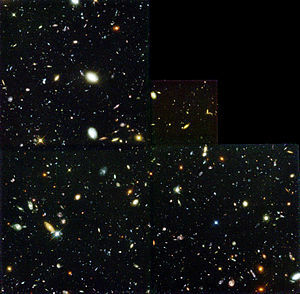 The Hubble Deep Field, around 3000 galaxies in a tiny patch of sky. Of these, perhaps 50-100 are home to a billions-year-old civilization. Are any of these galaxies even now sending us light that will one day reveal an extraordinary truth?